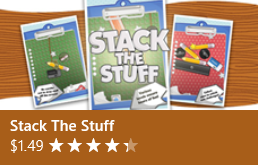 Stack the Stuff game is one of the best physics games which are now available for Windows 8 tablet and computers on Windows Store. Parents can download free trial of Stack the Stuff physics puzzle game which can be considered as an educational game for kids with its numerous physics puzzles for kids. I had the chance to play Stack the Stuff physics game with my daughter. I observed that she enjoyed playing Stack the Stuff Windows 8 game. It is possible to play Stack the Stuff using touch gestures on a Windows 8 tablet PC as well as playing this physics puzzle using your mouse pointer on laptop or desktop PC. Stack the Stuff physics games are available for many mobile computing platforms like Android, iPhone or now for Windows 8. If you are a Windows 8 user and looking for Windows 8 games, Stack the Stuff game is one of the entertaining physics games you will love to download and play on your PC. You can visit the Stack the Stuff Windows 8 app page on Windows Store using this link. In free trial edition you will find 30 physics puzzles which will enjoy you and your kids while trying to solve each puzzle. If you decide to purchase full version of Stack the Stuff puzzle game for 1.49$, you will have a total of 120 physics puzzle games to solve. Just give a try and play free then you can decide to buy or not. But I'm sure you will like to play each exciting level and will look for more puzzles to solve. In each puzzle level, there are three stars you need to grab by stacking different stuff top on another. Game controls are easy to learn. All you need to do is to drag and drop the stuff in order. You can use your fingers on a touchscreen or use your mouse pointer to drag and drop items on the game surface. If you enjoy the first levels, please try playing on the logo screen too. Perhaps there is a hidden puzzle on logo screen as well :) You may find some interesting physics puzzles on the credit screen as well. On each puzzle level, there are two buttons at the bottom of the screen. Sorry, I said button! Are not they only buttons? Worth to check, maybe they are additional fun to this entertaining physics puzzle game for Windows 8.